From hanging shower curtains to hanging bath towels, tension rods really don’t have a lot of uses that we typically think of immediately that doesn’t involve the bathroom. But honestly, this inexpensive household item is actually quite underestimated. Truth is, tension rods may actually be one of the most underestimated tools that could be utilized in any room of the house. Think about it, they’re cheap, adaptable, and they come in tons of different colors, shapes, and sizes. They can basically fit anywhere and can even hold a pretty good amount of weight. Here are 8 awesome ways to transform your home with a tension rod, and be on the road to becoming more organized. Simply place a tension rod in between two shelves or bookcases in the play room, add some curtains, and you’ve got a fun stage area that your little ones will love. Think of all the shows they could put on for you! Using a tension rod and some shower hooks, you can transform the inside of the small, cramped cupboard into an organized dream. You won’t have to clank around searching for the right pan ever again! Living without a shoe organizer is like living in absolute chaos. You can’t find the matching pair and they take up so much unwanted space. Instead of buying an expensive organizer to solve your problems, just use four tension rods. Set them at different heights depending on the type of shoes you have, and you’ll be all set. Create a cozy little fort or reading area in your kids’ rooms that they will absolutely adore! All you need is a tension rod, curtains, and a reasonable amount of space between a crib or bed and the wall. This could also work with just about any other piece of furniture you want. Even better, this is a much cheaper option of some other DIY projects floating around out there. Cleaning supply cabinets are often messy and cluttered. Free up some space by hanging some of the bottles from a tension rod inside the cabinet. Then, every time you open the cabinet, you’ll be able to easily find what you’re after. Cutting boards are bulky and take up a lot of space in a cabinet. Even though they’re relatively thin, if you lay them flat in the cabinet, you’re likely to just stack things on them, making it harder to get to later. Instead, try standing them on their sides, and using smaller tension rods to keep them upright. This even works well for cook sheets too! 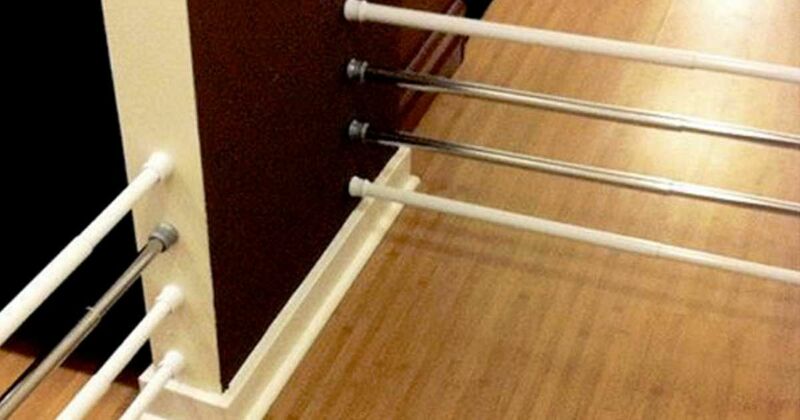 If you have little ones or dogs that you don’t want roaming around the house, but you don’t like the eyesore of baby gates, this solution is for you! You alter the height as your little one grows, and you don’t have a baby gate leftover you won’t want or need later.